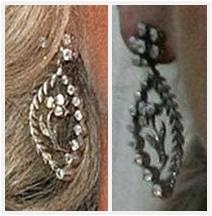 The earrings worn by The Duchess of Cornwall for the blessing ceremony on the day she wed The Prince of Wales were a pair from her personal collection. Designed in diamonds, they have an arched pendant with a flower and stem inside hanging from a small flower stud. The hoop of the pendant has a line of single round stones on one side and a chevron or leaf pattern on the other. An obvious conclusion here would be that they were a retail piece from a jeweler at one point in time (if you have more information, please let me know). As for Camilla, these earrings were a particular favorite to wear with her diamond serpent necklace early on (as seen above, at a 2005 White House dinner). She does continue to use them, though we naturally see them less often as the variety in her collection has grown.